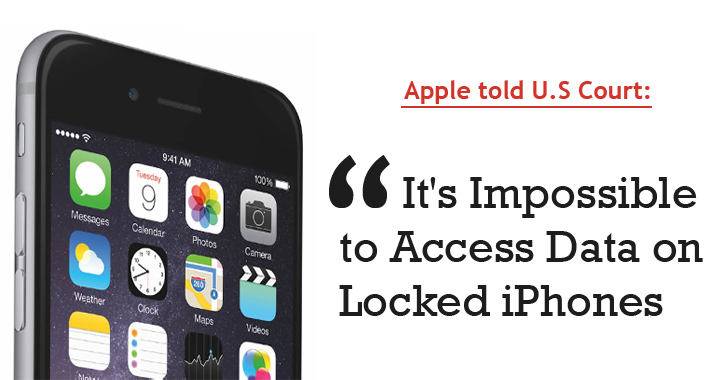 US Federal Official: Unlock that iPhone for me? Apple: Sorry, Nobody can do this! Neither we, nor you. Yes, in a similar manner, Apple told a U.S. federal judge that it is "IMPOSSIBLE" to access data stored on a locked iPhone running iOS 8 or later iOS operating system. In short, Apple has reminded everyone that the tech giant can not, and will not, break its users’ encryption if the government official asks it to. Apple revealed this in a court filing late Monday in response to the U.S. federal magistrate judge, who is being requested by the Justice Department to force the company to help authorities extract data from a seized iPhone. However, Apple says that it has the "technical ability" to help federal enforcement unlock older iOS devices – and almost 10 percent of iOS devices are running older versions of the operating system. "In most cases now and in the future, the government's requested order would be substantially burdensome, as it would be impossible to perform. For devices running iOS 8 or higher, [the company] wouldn't have the technical ability to do what the government requests – take possession of a password protected device from the government and extract unencrypted user data from that device for the government. Among the security features in iOS 8 is a feature that prevents anyone without the device’s passcode from accessing the device’s encrypted data. This includes Apple." A hearing regarding this case is expected to take place on this Friday, which will determine whether or not the company can be forced to help the federal agencies access the locked iPhone data on a search warrant. While Apple has positioned itself as a strong defender of its user privacy, still your iPhone is not completely protected. Last year, security researcher Jonathan Zdziarski published a blog post showing how some data is still within the government's scope. So, it is just the protection that the big tech giant is providing you and hopefully, will not help break down. In an open letter posted on its website, Apple's CEO Tim Cook clearly tells his customers that "We have never worked with any government agency from any country to create a backdoor in any of our products or services. We have also never allowed access to our servers. And we never will."